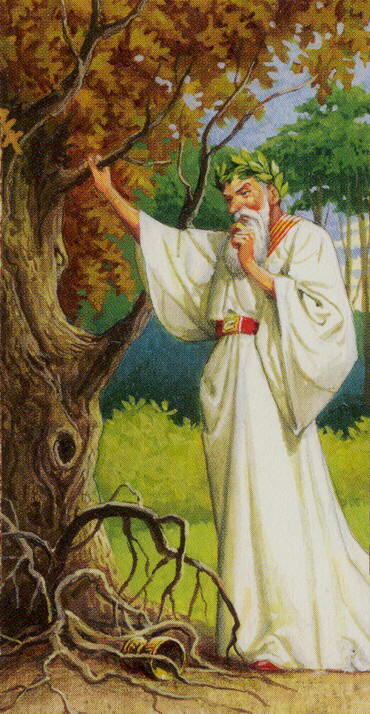 The Tarot of the Druids is a Celtic-inspired Tarot by Italian artists Antonio Lupatelli (Tarot of the Gnomes) and Severino Baraldi (Tarot of the Journey to the Orient). The major arcana cards are associated with Celtic deities, faeries and characters from mythology. They are titled with the Gaelic name of the deity on the card. The four suits of the minor arcana are: Chalices, Swords, Aguinum � a talisman � for Pentacles, and Mistletoe for Wands. These cards have images of Celtic life connected with nature.